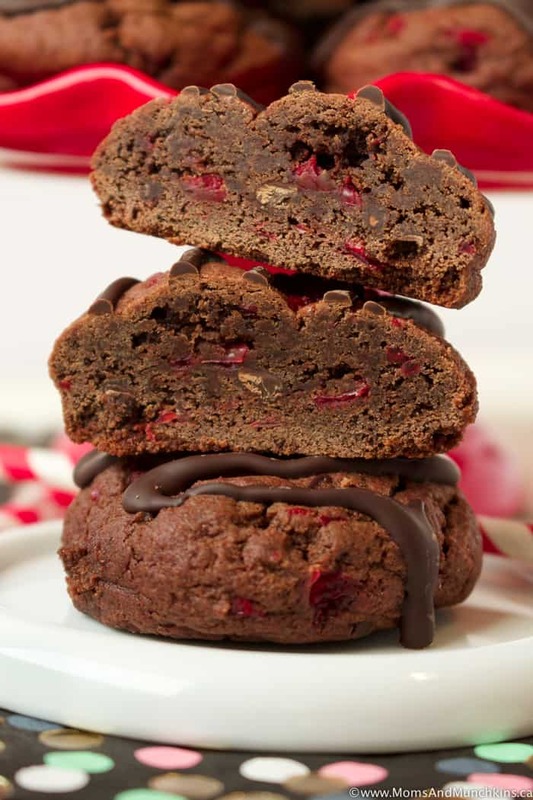 These Chocolate Cherry Cookies are a yummy addition to holiday baking tins. With a full cup of chopped maraschino cherries in this cookie dough, there’s cherry in every cookie bite! I’ll admit I had to try a couple of rounds for this recipe to get it right. The first time around I just placed one full maraschino cherry in the middle of each cookie but I didn’t find that it gave the cookies enough cherry flavor. Round two – chopped maraschino cherries – was certainly the winner! Trust me, there was a lot of taste testing here (hey, someone has to do it!) 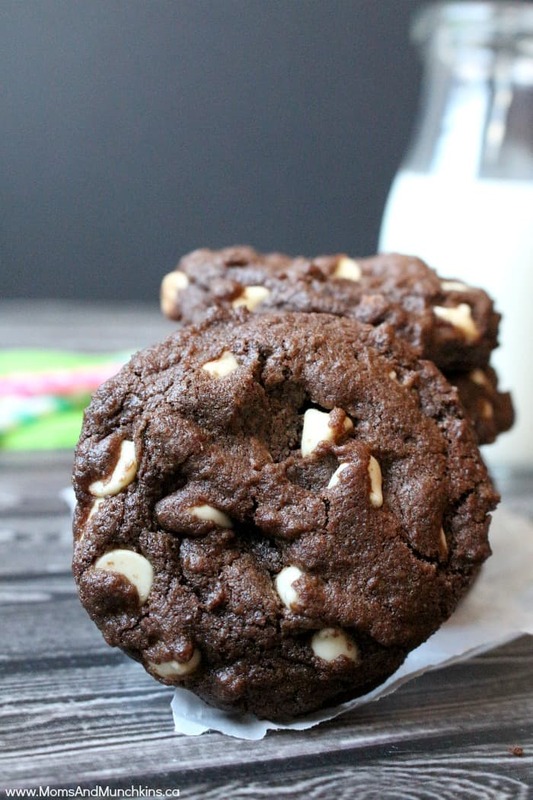 and these thick, chewy cookies are sure to be a hit this holiday season. For the cherries in this cookie recipe, you’ll want to buy a 375ml jar of maraschino cherries in heavy syrup. You’ll only need 1 tablespoon of the syrup in the recipe plus 1 cup of the cherries. Make sure you don’t use more than 1 tablespoon of the syrup or your cookie dough will be too thin. For the cherries in this cookie recipe, you'll want to buy a 375ml jar of maraschino cherries in heavy syrup. You'll only need 1 tablespoon of the syrup in the recipe plus 1 cup of the cherries. Make sure you don't use more than 1 tablespoon of the syrup or your cookie dough will be too thin. Line a cookie baking sheet with a silicone baking mat and set aside. In a large bowl, beat together butter, brown sugar and granulated sugar until well mixed. Add in eggs, vanilla extract and cherry syrup. Beat just until mixed. In a separate medium-sized bowl, combine flour, baking soda, cocoa, and salt. Stir well to mix. Pour dry ingredients into wet ingredients and beat just until mixed. Do not over mix. Stir in chocolate chips and chopped cherries. Form cookies into 2 tablespoon sized balls. Place cookies (2 inches apart) on baking sheet. Remove from oven and let cool on baking sheet for 5 minutes before removing to wire rack to cool completely. 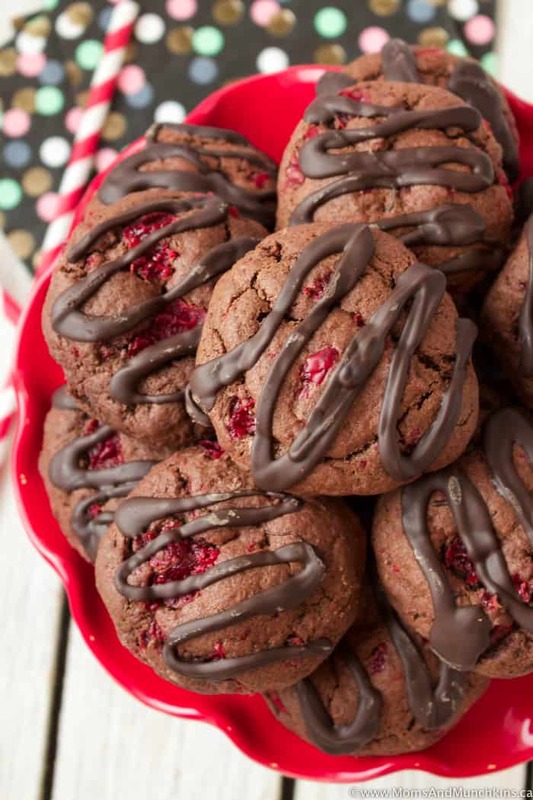 Drizzle melted Baker's chocolate over the top of each cookie and allow chocolate to harden before serving or packaging cookies for the fridge. White Chocolate Chip Cookies – these are amazing with peanut butter chips too! 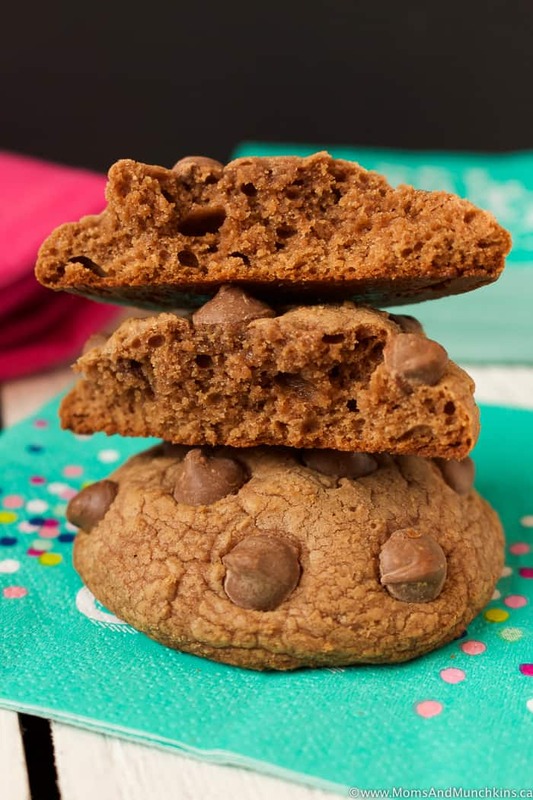 Milk Chocolate Cookies – I bet you can’t stop at one! 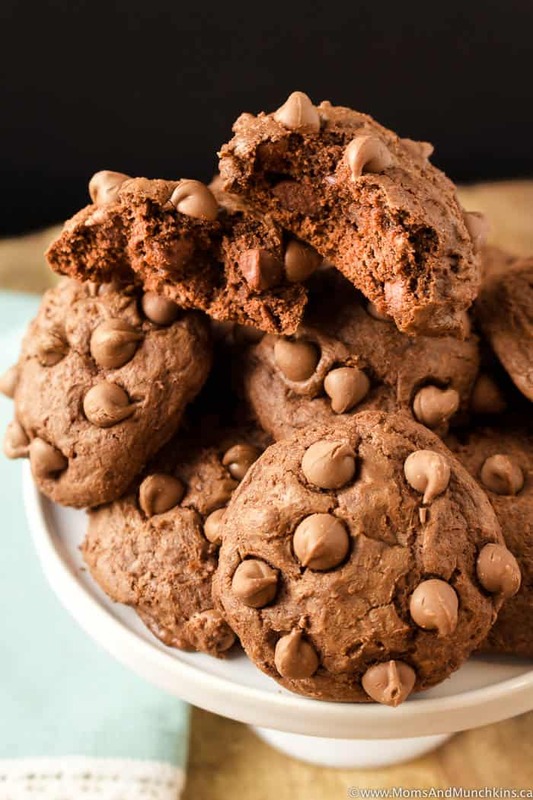 Brownie Cookies – you can’t go wrong with a cookie that tastes like a brownie, right? Visit our Recipes page for more delicious ideas. Stay updated on the latest home entertaining ideas by following us on Facebook, Instagram, Pinterest and Twitter.